I've never been named an ambassador. I was once, like the Philadelphia Eagles' Hugh Douglas, a badassador, but that is altogether a different thing. 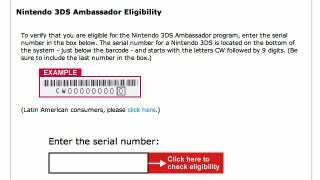 Anyway, this free-games 3DS Ambassador program, rewarding suckers early adopters like yours truly, required North American customers to log into the Nintendo eShop before Aug. 11. I was curious whether in fact I was registered. Now we can check. Nintendo rolled out this handy tool to check that status for Americas customers. (Customers in Japan had registered by visiting a website, which provided confirmation there to them at the time). Just drop in your 3DS serial number on the back of the device (CW plus the nine numbers) and it'll tell you. If you're enrolled, you're entitled to 10 NES Virtual Console games from the eShop beginning Sept. 1. Another 10 Game Boy Advance Virtual Console games will be made available to you later.